When I was creating a new post on my blog, I stumbled a news on my dashboard and saw WordPress 2.3 is released on 24 September 2007. This new version 2.3 “Dexter” is ready to rock the world. So, when are you upgrading your WordPress? WordPress 2.2.3 is released today. It is a security and bug-fix release for the 2.2 series. WordPress suggest that an immediately is necessary since this is a security release. Two of the fixes are high priority. You can download version 2.2.3 at WordPress download page. An upgrading instructions is including an extended upgrade guide are available. WordPress first fine product. 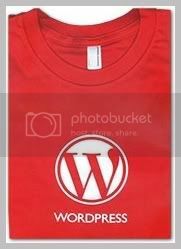 A short sleeve red t-shirt made of high quality American Apparel with screen printed with the WordPress logo on the centre chest. It is available now in a mens and a more fitted ladies style. Styles are availabe for a limited time only. Probably about 2-3 years. Once they’re gone, it will never be printed again. Grab it while you can. It is selling at £9.50 GBP per piece (without delivery). Interested? Please visit WordPress Shop now.